Indoor Golf Swing Trainer, PGA Endorsements, 4 strokes off over 18 holes, 90 day GUARANTEE! PGA Pro Tim Hurja, Anthony Robbins GOLF Coach - It's one of the most incredible golf aids and the tempo is great! Helps me visualize a straight release. SwayGolf - They took the time to develop a golf training tool that brings practice indoors. There is very similar product out there, but it does not feature any of the realism that this product offers. Sports Product Review - It feels exactly like you're swinging a real club. The shaft flexes and the weighted bottom brings the device through the zone at the identical speed and resistance of any club in your bag. You can't stop. You can't put it down. GolfLife Chris Bourquin - I've gone +1, +1 &+4 over my last 3 games and managed to drop a full point off my handicap in the last 6 with warming up on nothing but this Indoor Swing Trainer. No range balls at all. FLEXIBLE SHAFT: power is generated as the shaft bends, the weighted head pulls your swing into a full follow through position. 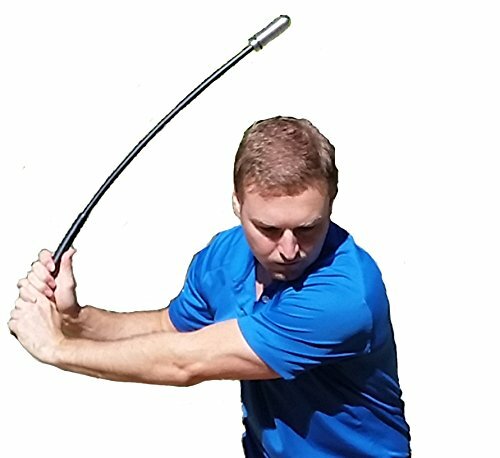 Scientifically designed by a NASA Engineer with a handicap of 3, this Swing trainers unique shaft flexibility and specific weight provide a realistic follow through to improve your golf swing, even while indoors! 6'4" Pro Golfer, David Lord uses his indoors, 9" ceilings! GSRN's Timing Improver is deliberately low tech, needs no batteries or charge ups and remains usable in damp weather and if unused for a time (not that you'll want to). Of course, the best, most rewarding way to measure your golf improvement is to book a game of golf. QUALITY: Designed for every day use, guaranteed for 24 months, guaranteed to reduce your handicap in 30 days or your money back! CONSISTENT SWING: PGA Pro Tim Hurja It will take your game to the next level! Allows to find your own path and tempo. If you have any questions about this product by Golf Swing Right Now, contact us by completing and submitting the form below. If you are looking for a specif part number, please include it with your message.